View all of the latest Bend Real Estate in Oregon below! With a population of just over 80,000, Bend is a well-rounded community, offering many great restaurants, shopping, dining, and entertainment opportunities, lots of outdoor recreation, and beautiful homes and properties. The Bend real estate market offers properties for everyone, including downtown homes, condos, townhomes, luxury homes, small acreage and more. Start searching through all of the Bend homes for sale below! 726 Properties Found. Page 1 of 61. The real estate market in Bend, Oregon has been booming since the mid 90's. You'll find newer homes for sale in all of Bend, and some older areas around the downtown and westside areas. There are also a variety of condos and townhomes available. Whether you're looking to invest in a duplex, looking for your first home, or wanting to buy a luxury property, there is something in the area for you. Bend is located on the east side of the Cascade Mountain Range in Central Oregon. The city offers breath taking mountain views and towering Ponderosa pine trees. 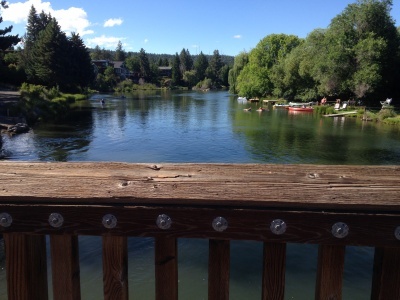 The Deschutes river flows through town, and offers many parks and trails to enjoy along the water way, as well as some prime riverfront real estate. East of town offers high desert with beautiful rock formations, old growth juniper trees, and miles of OHV (off highway vehicle) trails. While the west side of town offers towering Ponderosa Pine trees, hiking, biking, and river access. Bend is also home to Mt Bachelor. The popular ski resort is only a short drive from the available Bend real estate. Bend is unique, in that we're on the break of the Cascade Mountains and the high desert of Central Oregon. So we have lush forest on the west side of town and sage brush and desert on the east side. Prices on homes for sale on the westside are higher than similar residences on the east side of town. Properties near the downtown area and west of the Deschutes river are in demand, due to their proximity to downtown, outdoor recreation, the river, brew pubs, dining, entertainment and more. Neighborhoods around the city vary in size and amenities. Bend real estate offers everything from upper-end, gated golf communities, to small acreage, large acreage, condos, townhomes, planned unit developments and smaller affordable communities. If you're in the real estate market and want to find the home and neighborhood that fit you best, contact Sedonia Darling online or call (541) 749-0509. If you have any questions about real estate, relocating, or other Bend resources, please contact me. Below I've included some school information as well as links to helpful local sites to help you find the right area for your future Bend home. The city and chamber pages will give you a good idea of what the community has to offer, and the direction that the city is going. Bend falls within the Bend LaPine School District. The city widely is known for its great schools and sports programs. Bend offers 3 High Schools, and several middle and elementary schools, as well as some great private options. Are you looking for a home in a particular school district? We can send you all real estate listings matching your needs in any school district of your choice. Read more at Bend School Information and Links. Another popular school option is Cascade Academy, located in Tumalo. Bend is known for its abundance of sunny days (especially compared to Western Oregon). A typical year brings almost 300 sunny days. Temperatures fluctuate, but summer consists of warm days, little humidity, and cool nights. Winter brings cooler temperatures, but not a lot of moisture. We rarely see more than 6 inches of snow on the ground in Bend (but it can happen). Some years we rarely see a snowflake, while other years we get consistent snow. It usually doesn't last long though, as temperatures usually rise within a week or two and melt the snow. The average precipitation in Bend is about 12 inches a year, with an average of roughly 33 inches of total snowfall a year. Information on the current market and statistics from the Central Oregon MLS. For up to date market conditions, please sign up for our monthly market tracker report here. Or contact us by phone or e-mail and let us know what kind of market statistics you are looking for. It's important in our ever changing Bend market to stay up to date on home values and appreciation. Bend has been one of the fastest appreciating markets in the nation at times. Home prices have appreciated a lot over the past 20 years. Custom Bend real estate trends and market statistic reports are available. Contact us today. Are you interested in a Bend home? Don't hesitate to contact Sedonia Darling online or call (541) 749-0509 to consult a local Bend real estate agent!